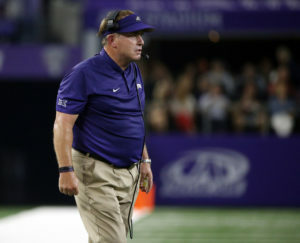 TCU football head coach Gary Patterson is the most successful coach in Horned Frogs program history with 163 wins in his career in Fort Worth. He’s already been immortalized outside of Amon G. Carter Stadium as one of the greats with a statue next to legendary coach Dutch Meyer and 1938 Heisman Trophy winner Davey O’Brien. Yet, Patterson remains unyielding when it comes to his game preparation and film study, pulling up tape on Texas Tech stars from then and now including Kansas City Chiefs quarterback Patrick Mahomes. The fire that still burns strongly inside Patterson 21 years into his time TCU comes from his parents, Gail and Keith, and their blue-collar attitudes. Patterson’s father, Keith W. Patterson, passed away at age 82 from a battle with cancer on January 20. His mother, Gail Patterson, passed away at age 81 last Thursday. Her funeral is Friday in Larned, Kansas. Both were, in the words of Patterson, “big Frog fans.” Patterson said he visited his dad shortly before he passed, and his dad didn’t want to talk about himself, but rather that his son needed to get back to recruiting in order to build the best TCU football team possible. When he went up to see his mom following TCU’s win against Iowa State, she had a similar idea when she told her son to return to Fort Worth and prepare for Texas Tech. So when you see Patterson yelling himself red in the face to ensure his defense is lined up correctly before each play begins, you’ll know the reason why: the desire to provide a better life for his family. The point Patterson concluded his Tuesday reflections with was to make sure others appreciate their family and prioritize spending time with them.